Compatible with 111 0335 Track System; requires 111 0336 Track System Transit, sold separately. 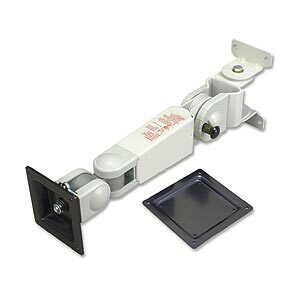 This industrial-duty LCD mount is fully articulated with no less than 4 pivot points and has a 16 standoff from the wall. It is constructed of heavy-duty steel with durable nylon pivot washers and it provides a very sturdy platform with no shake or unwanted motion. Supports between 6.6 and 17.6 pounds (3-8kg). Includes mounting hardware and 100mm adapter plate.